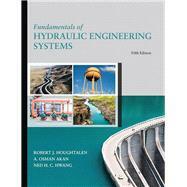 by Houghtalen, Robert J.; Akan, A. Osman H.; Hwang, Ned H. C.
Fundamentals of Hydraulic Engineering Systems bridges the gap between fundamental principles and techniques applied to the design and analysis of hydraulic engineering systems. An extension of fluid mechanics, hydraulics is often more difficult to understand, and experience shows that many engineering students have trouble solving practical problems in hydraulics. The book builds on readers’ problem solving skills by presenting various problem and solution scenarios throughout including effective design procedures, equations, tables and graphs, and helpful computer software. The first half of the Fifth Edition discusses the fundamentals of fluid statics, fluid dynamics, and pipe flow, giving readers practical insight on water flow and pipe design. The latter half dives into water flow and hydraulic systems design, covering some of the most common hydraulic structures such as wells, dams, spillways, culverts, and stilling basins. The book ends with four ancillary topics: measurements, model studies, hydrology for hydraulic design and statistical methods in hydrology, as well as common techniques for obtaining hydraulic design flows.